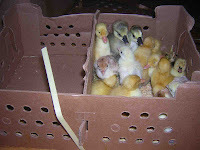 Holy crap, the ducklings, goslings, and turkeys came a week early. I’ll write about the poults tomorrow. Today I want you to focus on the fuzzy softness of these water fowl. The arrived in the Murray McMurray box via the post office. These guys–two goslings, seven ducklings– are so light, they’re like little puffs of air when you pick them up. They’re incredibly messy eaters and love to splash around their water dish (lined with rocks so they don’t get totally soaking wet and catch a chill). They grow really fast, too, I’ll be sure to take lots of photos and document their growth. A few years ago I lost both my geese and a few of the ducks to a marauding oppossom, this time around I’m going to be very careful about predators. My heart is swelling just thinking about the beet I pulled up in the garden. Thing was the size of someone’s head. In fact, here’s Severine and her head. 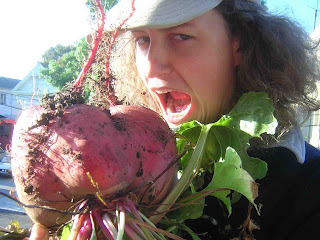 The beet grew to this monstrous proportion in the back of a bed. I kept thinking, “I need to harvest those beets there.” But then I’d forget. Finally, the thing started to go to flower (a thick stalk starts shooting up, it’s quite lovely actually) so I got in there and pulled the beast out. It must have weighed 10 pounds. After showing it off for a few hours (I took it to the Biofuel Oasis and displayed it for biodiesel customers for awhile), I cut it up and roasted it with garlic, marjoram flowers, and salt. I thought it was a choigga–the striped red and white beet–but this monster was all white inside. The taste? 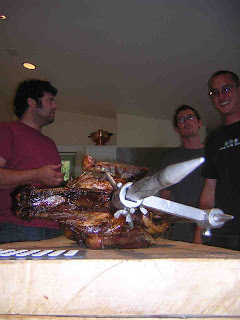 It was just okay, so I fed the leftovers to the ever-hungry hogs. Many people wonder what the urban farm looks like. 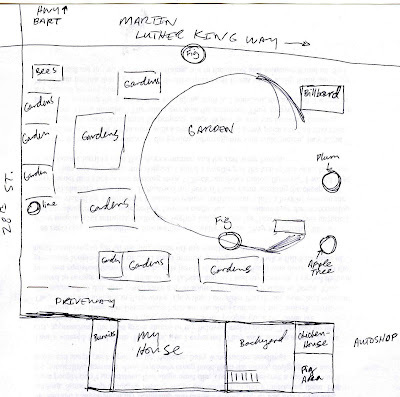 Here’s a rough diagram. Note that the circles represent trees, the squares raised beds (and billboards, the current one, We Buy Homes Fast: 888-998-4581). You can see that the majority of the farm is the abandoned “squat” lot–future home for the ducks and geese, current home to two stray cats and a beehive. Yesterday Willow came over and we built a pig enclosure in the lot. That way the hogs will get some pasture and exercise. The only problem? When I tried to walk the girl pig over to the garden, she got really nervous and wouldn’t leave her area. I’m going to buy a large dog harness. 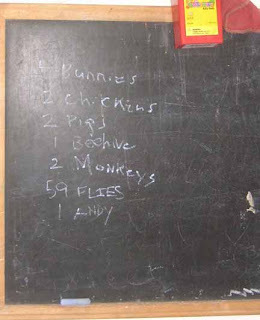 Our plans dashed, Willow and I drank a bunch of tea and sketched out a diagram for a smokehouse. Yee-haw! Which Baby Animal Is More Cute? Spring has hit hard. There are so many baby animals running around my house. 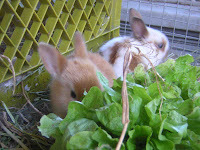 Out on the deck are the bunnies. The mama rabbit finally let me stick my arm in the box to get a head count: 9 babies! There are two solid browns, two solid whites, and five brown and whites. They’re just now starting to eat real food. Then, walk in the living room where you’ll find…40 baby chickies! The came from Murray McMurray. I’m taking care of them until they’re ready to go to their new homes in West Oakland. My friend Willow of City Slicker Farms runs a backyard garden project that provides raised garden beds and three chickens to families who want to do some urban farming. 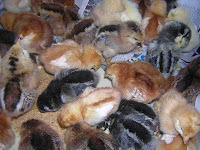 The chicks are Rhode Island Reds, Aracaunas, Buff Orpingtons, and Barred Rocks. Go chickens. 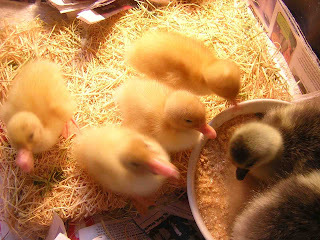 Next week, prepare yourself for another cute baby animal post when the ducklings, goslings, and turkey poults arrive. Would You Deny This Pig? New low levels. 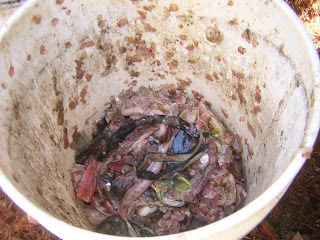 This bucket contains fish guts. This pig is very cute, though, so don’t you want to feed him something his likes? I mean loves? 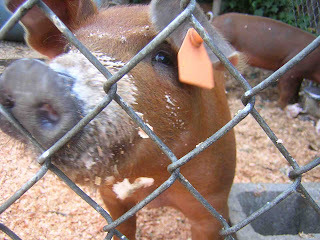 Did you know pigs love fish guts? Yup. Fishermen in Maine used to (probably still do?) feed their pigs the fish guts all summer, then corn for a few weeks before slaughter so they didn’t taste like, well, fish. I know the pigs like something because they’ll fight over it when I pour it into the slop trough. When I first poured a few fish guts found in Oakland’s Chinatown, they literally shrieked with delight. So William and I go out on fish-finding missions and get them want they really want. Oh, so gross, yet so cute, and later, so delicious. William’s good friend from Florida is here visiting. We’re trying to woo him to move to the Bay Area. Last night we ate a salad and fava beans and afterward he said it was the best meal ever. Freshness does count, doesn’t it? I feel like the food from the garden has more nutrients, we don’t have to eat as much to feel full. It makes me so happy to feed the people (and animals) I love food from the garden. In return, Andy fixed my bike’s broken brake cable. What a lovely symbiotic relationship!